Love on Haight: the Grateful Dead and San Francisco in 1967—an exhibit commemorating the 50th anniversary of the historic Summer of Love—is open at McHenry Library’s Dead Central. Above: The Grateful Dead stand on the corner of Haight and Ashbury streets, San Francisco, 1966 (Photo: Herb Greene, courtesy Special Collections, University Library, University of California Santa Cruz)Highlighting materials from multiple collections housed in the library’s Special Collections and Archives, the exhibit features posters, photography, and memorabilia from the Grateful Dead Archive and photographs from Ruth-Marion Baruch’s 1967 Haight-Ashbury series. “We want to provide context for the Grateful Dead in 1967 and to highlight two high-profile collections (the Grateful Dead Archive and the Pirkle Jones and Ruth-Marion Baruch Photography collection) as well as lesser known materials from both Special Collections and the McHenry stacks,” said Elisabeth Remak-Honnef, head of Special Collections and Archives. The exhibit will be on display through June 2018. Admission is free and open to the public during regular library hours. The beloved Quarry Amphitheater has undergone a major renovation and is reopening this fall. For nearly 40 years this stunning outdoor gathering space located in a once-active quarry operation was the key place to go for big events. But the site fell into disrepair and was closed to events in 2006. The $8 million renovation project got a $6.4 million boost from the Student Fee Advisory Committee. And alumni, staff, faculty, and community members also gave to the project. The funds went toward bringing the space back to its former glory with new infrastructure that will allow for future improvements. Benches have been replaced, while keeping the Quarry’s unique asymmetry. Seating was expanded from a capacity of 1,636 to 2,000, the venue was made current with building codes and accessibility requirements, lighting was introduced for night events, and Wi-Fi capability has been added. In coming months, the campus will develop a schedule of concerts, performances, and other Quarry events. UC Santa Cruz has launched a new data science research center, Data, Discovery, and Decisions (D3). Led by Lise Getoor, professor of computer science in the Baskin School of Engineering, D3 provides a platform for collaboration between industry and academia in the emerging field of data science. The ability to collect and analyze vast amounts of data has driven the emergence of data science as a new discipline. The Baskin School of Engineering has identified data science as a key focus area for the school. A capacity crowd filled the atrium floor of the Museum of Art and History in downtown Santa Cruz for a recent public event presented by the UC Santa Cruz Institute for Humanities Research (IHR). The occasion was Radical Jewish Politics: From Marx to Bernie, the second installment of the IHR’s new “UCSC Night at the Museum” series for the local community. It offered a discussion of the history of radical Jewish politics—inspired by both the centennial of the Russian Revolution in 2017 and the stunning electoral success of Bernie Sanders, which has led to a renewed interest in socialism in the United States. The evening featured a public conversation with UC Santa Cruz alumnus Tony Michels (Stevenson ‘89, politics), professor of American Jewish history at the University of Wisconsin–Madison, author of A Fire in Their Hearts: Yiddish Socialists in New York, and editor of Jewish Radicals: A Documentary History. Public institutions are increasingly focused on the degree to which they enable upward mobility. For many, it is vital that U.S. higher education afford people from lower-income households, and from traditionally underrepresented ethnicities and cultural backgrounds, equitable educational opportunities. “In order to unlock the full potential of the country, you need to do more than educate the same elite population generation after generation,” said acting Vice Provost for Academic Affairs Martin Berger. 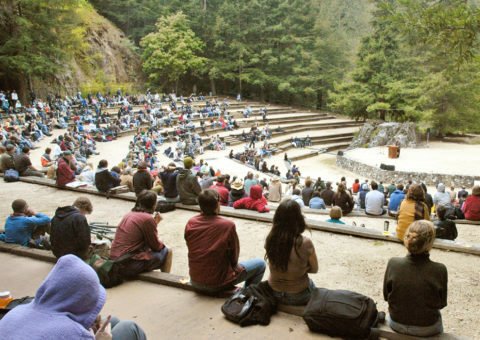 With this in mind, UC Santa Cruz launched the First-Gen Faculty campaign, which encourages professors to identify themselves as the first in their families to graduate from a U.S. four-year university. So far, 54 professors have identified themselves as first-generation faculty, including Rebecca Covarrubias, assistant professor of psychology. “In drawing attention to the shared identities among students and faculty, we can send a clear message that we want you here, that you belong here, and you will succeed here,” said Covarrubias. In 2016, 42 percent of the entering class at UC Santa Cruz were first-generation college students. First-generation faculty Catherine “Cat” Ramírez, associate professor, Latin American and Latino studies, and director, Chicano Latino Research Center; Jaye Padgett, professor, Linguistics Department, and vice provost for student success; Veronica Terriquez, associate professor, Sociology Department; Rebecca Covarrubias, assistant professor, Psychology Department; Juan Poblete, professor, Literature Department. The U.S. Forest Service awarded a $250,000 grant to the Center for the Study of the Force Majeure, a research center based in the Arts Division at UC Santa Cruz. Founded by Newton and Helen Mayer Harrison, research professors in the Digital Arts and New Media Program, the center brings together artists and scientists to design ecosystem-adaptation projects in critical regions around the world to respond to climate change. The project will estimate the supply of wood biomass in the area east of the central Sierra crest and in western Nevada, and assess the possibility of producing wood products from that supply. The aim of the grant—part of $8.3 million in distributed funds from the U.S. Forest Service—is to stimulate the removal of hazardous fuels from forests to reduce the risk of wildfires and promote forest health, while at the same time spurring the economic development of rural communities. An off-campus accelerator intended to jump-start technology businesses launched in June with the support of UC Santa Cruz. Three campus-connected ventures—Fuzz Stati0n, Santa Cruz WaveWorks, and Scoot Science—along with a fourth startup, PhotoBloomAR, began a pilot cohort with the accelerator, called Santa Cruz Accelerates. 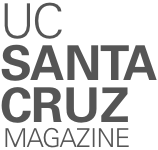 The UC Santa Cruz Office of Research provided $500,000 for Santa Cruz Accelerates to serve early-stage technology businesses that have a product but haven’t started selling it. The accelerator will be run by Santa Cruz Works, a local nonprofit that supports science and technology companies. The University of California is committed to ensuring that the knowledge and research developed on its campuses are used to the fullest possible extent so the benefits reach the public, said Mohamed Abousalem, assistant vice chancellor for the Office for Research, Industry Alliances and Technology Commercialization. Paola Gomez was eager to leave East LA to study film and environmental studies at UC Santa Cruz. But homesickness hit hard during her first quarter on campus. 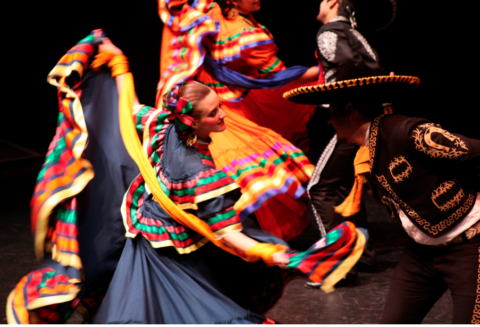 All of that changed when Gomez discovered Grupo Folklórico Los Mejicas, a student-run dance troupe that celebrates the regional music, dances, and traditions of Mexico. Today, Gomez is one of 51 members of Los Mejicas. The troupe performs regularly on campus and for elementary and high school students, festivals, and special events. Params Raman, 31, churned through the water at UC Santa Cruz’s Olympic-sized pool, a feat that was, at once, both ordinary and extraordinary. Only a month earlier, Raman, a graduate student who is doing research in artificial intelligence, was terrified of the water. He’d grown up in the northeastern and southern parts of India where, he said, there was no access to swimming pools—only dangerous wild rivers and dark cistern-like wells. But under the watchful eye of instructor Julie Kimball (Crown ‘78, German literature), Raman was stroking across the pool along with eight classmates. “I feel like learning to swim opens up your world to so many other things you can do,” said Raman, who wants to learn to surf, snorkel, and scuba dive once he’s mastered swimming. “When people work with their own fears, they realize anything is possible,” said Kimball. Beginning swim classes are offered through the Office of Physical Education, Recreation and Sports. New research into the behavior of mountain lions indicates that they don’t like encountering humans any more than we like bumping into them. The findings are particularly valuable as human development encroaches on lion habitat and drives up the number of human-puma encounters. Justine Smith (M.A. 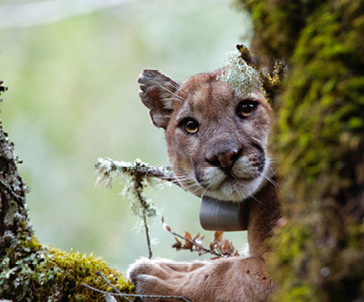 ’09), who led the study as a graduate student in environmental studies at UC Santa Cruz, and her colleagues placed audio equipment at puma kill sites in the Santa Cruz Mountains; when a puma came to feed, its movements triggered recordings of people talking, and a hidden camera captured the puma’s responses. They broadcast recordings of Pacific tree frogs as a control. “We found that pumas almost always ran from the sound of humans—and almost never ran from the sound of frogs,” said Smith, now a postdoctoral researcher at UC Berkeley. In addition to establishing the fear response, the study reveals changes in puma feeding behavior that could have implications for their well-being in human-dominated landscapes.